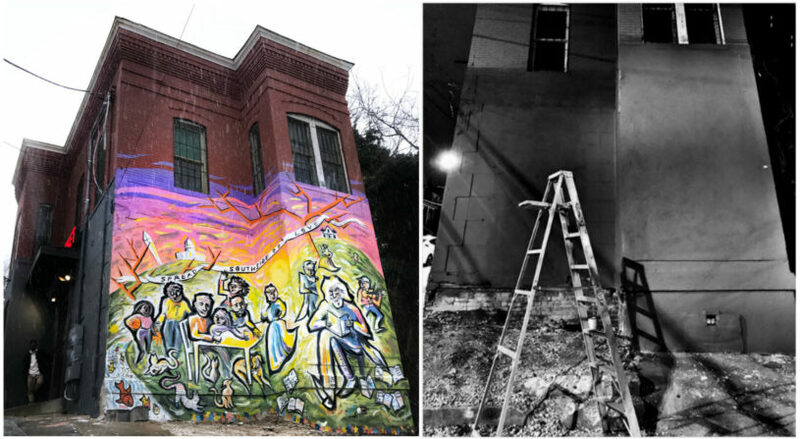 As we wrap up Black History Month, we want to share an amazing mural project that was recently completed as a part of the Frederick Douglass National Historic Site’s celebration of Douglass’ birthday. 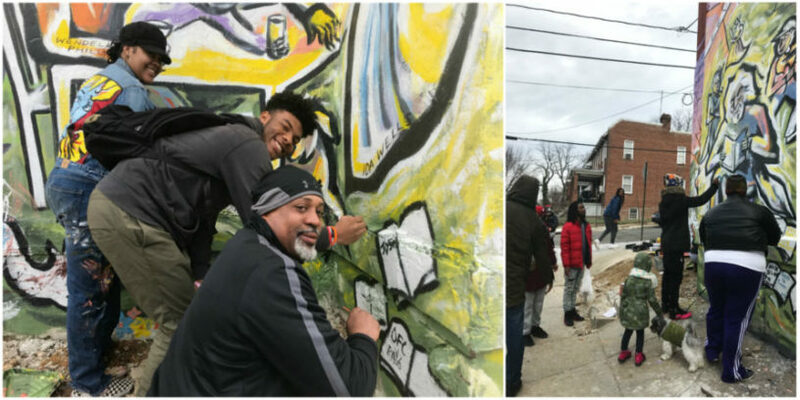 Led by local journalist and historian, John Muller, the project sought to create a mural installation that involves the local community and brings the spirit of the Frederick Douglass Bicentennial to the streets he walked and neighborhood he called home. The mural depicts an illustration of Frederick Douglass with other historical figures. Children and animals from the modern-day community stand next to these historical greats while near the Anacostia River. The words “Spread Southside Love” flows over the historic figures. The mural is located on 16th & W Street SE in Old Historic Anacostia, a block away from Frederick Douglass’ Cedar Hill House. John Muller, a local journalist and historian in Anacostia, originally reached out to Forklift in search of drop cloths, tarps, and scaffolding for the project he was leading to commemorate the Frederick Douglass Bicentennial and Anacostia Park Centennial. He was excited to instead find other materials, such as our “oops” paint and eco-friendly Amazon Paint which were used to paint the base of the mural for the ground and rolling green surface of Cedar Hill. Community members played a part in creating the mural. John’s knowledge and involvement in the Anacostia community inspired to him lead this mural project, since the community had been discussing the need for a beautification project for some time. In addition to covering the community for nearly a decade through a variety of online and print media outlets, John is also very well informed on the topic of Frederick Douglass, having written a book about Douglass’ final years in Washington, D.C.
Rebeka (right) with Nettie Washington Douglass, an anti-trafficking activist and Frederick Douglass’ great granddaughter. Before being commissioned for the mural, Rebeka focused on studying global environmental and social challenges – earning a Bachelor of Science Degree in Global Resource Systems and Master’s Degrees in Environmental Management from the University of British Columbia and Yale University. According to Rebeka, she has always been artistic, and although she didn’t initially know how to connect art to her studies, she eventually came to realize she could combine both of her strong interests – all thanks to her supportive classmates in grad school. Rebeka was inspired to become involved with the mural project because of Frederick Douglass’ historical significance. She feels he “continues to inspire so many, irrespective of race, age, or background, to this day. 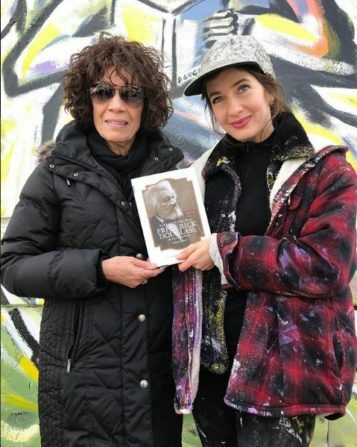 And the location of the mural, Anacostia in DC’s southeast, grapples more visibly than most places with the challenges Douglass worked so hard to address.” For her, the mural was a great “opportunity to explore the history of Frederick Douglass while engaging with the Anacostia community,” a project “100% in line” with her values. Forklift is honored to have played a part in such a meaningful project that impacted so many in our community. 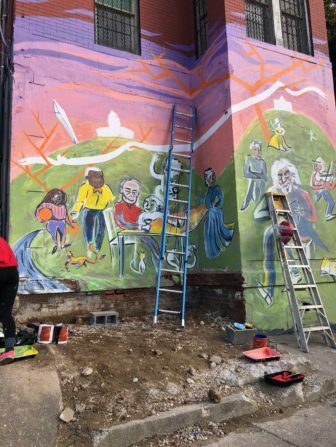 Not only did the mural bring the Anacostia community together, it also received lots of attention from local and national press – The Washington Informer, Philadelphia Daily Tribune, and ABC7, to name a few. The project’s GoFundMe account is still active. Any funds donated will help cover the costs of the muralist’s design time and labor, in addition to the cost of materials. To donate or learn more about the mural, click here!